This publication is the tenth edition of the condensed version of the OECD Model Tax Convention on Income and on Capital. 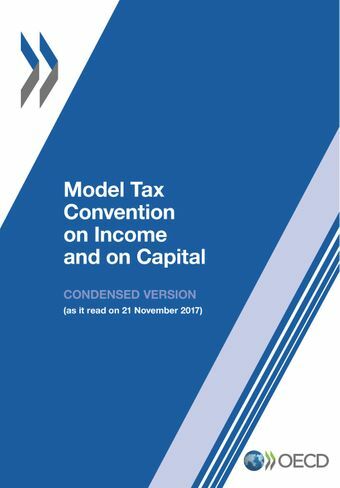 This shorter version contains the articles and commentaries of the Model Tax Convention on Income and Capital as it read on 21 November 2017, but without the historical notes and the background reports that are included in the full version.The full version of the OECD Model Tax Convention for each edition is published separately. It is available in print, PDF and web formats. The web format includes extensive interlinking, making it easy to link from articles to related commentaries. The web and PDF versions will be available via the OECD iLibrary. The OECD Model Tax Convention, a model for countries concluding bilateral tax conventions, plays a crucial role in removing tax related barriers to cross border trade and investment. It is the basis for negotiation and application of bilateral tax treaties between countries, designed to assist business while helping to prevent tax evasion and avoidance. The OECD Model also provides a means for settling on a uniform basis the most common problems that arise in the field of international double taxation. The 2017 edition of the OECD Model mainly reflects a consolidation of the treaty-related measures resulting from the work on the OECD/G20 BEPS Project under Action 2 (Neutralising the Effects of Hybrid Mismatch Arrangements), Action 6 (Preventing the Granting of Treaty Benefits in Inappropriate Circumstances), Action 7 (Preventing the Artificial Avoidance of Permanent Establishment Status) and Action 14 (Making Dispute Resolution More Effective). The OECD Model requires constant review to address the new tax issues that arise in connection with the evolution of the global economy. Working Party No. 1 of the OECD's Committee on Fiscal Affairs meets this need and its work results in regular changes to the Model. Updates were published in 1994, 1995, 1997, 1998, 2000, 2003, 2005, 2008, 2010, 2014, and 2017. The full version contains the full text of the Model Tax Convention as it read on 21 November 2017, including the Articles, Commentaries, non-member economies’ positions, the Recommendation of the OECD Council, the historical notes and the background reports.